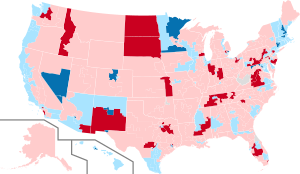 United_States_House_of_Representatives_elections,_2018 - TerritorioScuola Enhanced Wiki Alfa - Enhanced Search with WikiPedia Using Robots to display related resources from the web to all WikiPedia words (Video/Audio, .doc, ,pdf, .ppt, maps, edu, .html). Minnesota 1: Tim Walz retired to run successfully for Governor of Minnesota. Seat won by Jim Hagedorn. Arizona 2: Martha McSally retired to make an unsuccessful run for U.S. Senator. Seat won by Ann Kirkpatrick. New Mexico 2: Steve Pearce retired to make an unsuccessful run for Governor of New Mexico. Seat won by Xochitl Torres Small. Arizona 9: Kyrsten Sinema retired to run successfully for U.S. Senator. Seat won by Greg Stanton. Colorado 2: Jared Polis retired to run successfully for Governor of Colorado. Seat won by Joe Neguse. Hawaii 1: Colleen Hanabusa retired to run unsuccessfully for Governor of Hawaii. Seat won by Ed Case. Minnesota 5: Keith Ellison retired to run successfully for Minnesota Attorney General. Seat won by Ilhan Omar. Nevada 3: Jacky Rosen retired to run successfully for U.S. Senator. Seat won by Susie Lee. New Mexico 1: Michelle Lujan Grisham retired to run successfully for Governor of New Mexico. Seat won by Deb Haaland. Texas 16: Beto O'Rourke retired to run unsuccessfully for U.S. Senator Seat won by Veronica Escobar. Florida 6: Ron DeSantis resigned to run successfully for Governor of Florida. Seat won by Michael Waltz. Idaho 1: Raúl Labrador to run unsuccessfully for Governor of Idaho. Seat won by Russ Fulcher. Indiana 4: Todd Rokita retired to run unsuccessfully for U.S. Senator. Seat won by Jim Baird. Indiana 6: Luke Messer retired to run unsuccessfully for U.S. Senator. Seat won by Greg Pence. North Dakota at-large: Kevin Cramer retired to run successfully for U.S. Senator. Seat won by Kelly Armstrong. Ohio 16: Jim Renacci retired to run unsuccessfully for U.S. Senator. Seat won by Anthony Gonzalez. Pennsylvania 9: Lou Barletta (redistricted from the 11th district) retired to run unsuccessfully for U.S. Senator. Seat won by Dan Meuser. South Dakota at-large: Kristi Noem retired to run successfully for Governor of South Dakota. Seat won by Dusty Johnson. Tennessee 6: Diane Black retired to run unsuccessfully for Governor of Tennessee. Seat won by John Rose. Tennessee 7: Marsha Blackburn retired to run successfully for U.S. Senator. Seat won by Mark Green. West Virginia 3: Evan Jenkins retired to make an eventually unsuccessful run for Senate and resigned to become State Supreme Court Justice. Seat won by Carol Miller. The state congressional delegation changed from a 16-11 Republican majority to a 14-13 Republican majority. The state congressional delegation changed from a 10-4 Republican majority to a 9-5 Republican majority. The state congressional delegation remained the same at 2-0 for Democrats. The state congressional delegation remained the same at 2-0 for Republicans. The state congressional delegation changed from a 11-7 Democratic majority to a 13-5 Democratic majority. The state congressional delegation remained the same at 7-2 for Republicans. The state congressional delegation flipped from a 3-1 Republican majority to a 3-1 Democratic majority. The state congressional district changed from a 4-0 Republican majority to a 3-1 Republican majority. Republicans maintained a 5-1 majority of seats. The state congressional delegation remained the same at 5-1 for Republicans. The state congressional delegation flipped from a 1-1 tie to a 2-0 Democratic majority. This is also the first time when Maine's ranked choice voting was used to decide a House race. The state congressional delegation remained the same at 7-1 for Democrats. The Democrats retained their seat majority of 9-0. The state congressional delegation flipped from a 9-5 Republican majority to a 7-7 tie between the two parties. Four seats switched parties, but the switches kept the delegation's party ratio at 5-3 Democratic. R+13 Mia Love Republican 2014 Incumbent lost re-election. The Democrats maintained control of the sole seat in the state. The state congressional delegation flipped from a 7-4 Republican majority to a 7-4 Democratic majority. R+3 Scott Taylor Republican 2016 Incumbent lost re-election. R+6 Tom Garrett Republican 2016 Incumbent retired. R+13 Bob Goodlatte Republican 1992 Incumbent retired. R+6 Dave Brat Republican 2014 Incumbent lost re-election. D+1 Barbara Comstock Republican 2014 Incumbent lost re-election. Democrats increased their seat majority from 6-4 to 7-3. EVEN Dave Reichert Republican 2004 Incumbent retired. The state congressional delegation remained the same at 3-0 for Republicans. R+23 Vacant Rep. Evan Jenkins (R) resigned after the filing deadline. Republicans maintained their 5-3 seat majority. R+5 Paul Ryan Republican 1998 Incumbent retired. The election for a non-voting delegate from the Northern Mariana Islands was postponed until Tuesday, November 13, 2018 due to the impact of Typhoon Yutu. The Resident Commissioner of Puerto Rico is not up for re-election until 2020. Currently held by Republican Jenniffer González, who was first elected in 2016, the Resident Commissioner is the only member of the United States House of Representatives to serve a four-year term. ^ In addition, five of the six non-voting delegates in the U.S. House of Representatives were elected. ^ a b c d One seat was voided. ^ This figure represents the difference between the number of Democrats seated in the 116th Congress (235) and the number of Democrats seated in the 115th Congress (194). ^ This figure represents the difference between Republicans seated in the 116th Congress (199) and those seated in the 115th Congress (241). One seat, previously held by a Republican was voided. ^ a b The 116th Congress has one vacancy in the House of Representatives. For further information, see 2018 North Carolina's 9th congressional district election#Refusal of certification. ^ Not including the Resident Commissioner of Puerto Rico, who serves a four-year term. ^ Louisiana will hold runoff election(s) on December 8, 2018, for any race in which no one candidate wins a majority of the vote in the November jungle primary. ^ Galvin won the Democratic nomination as an "Undeclared" candidate. She will be listed on the ballot as Undeclared and the nominee of the Democratic Party. ^ On September 24, 2018, the Democratic nominee in Florida's 17th congressional district, April Freeman, died. On October 1, 2018, Ellison was announced as her replacement on the ballot. ^ a b c The Libertarian Party does not have ballot access in Ohio or Tennessee. Therefore, Libertarian candidates Johnathan Miller (Ohio's 15th district), Greg Samples (Tennessee's 2nd district), and David Ross (Tennessee's 6th district) appear on their ballots as "Independents." ^ a b "2018g - United States Elections Project". electproject.org. Retrieved December 11, 2018. ^ a b Leamon, Eileen J.; Bucelato, Jason, eds. (December 2017). 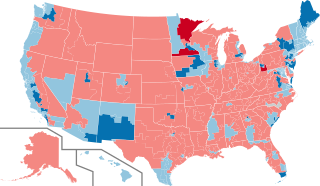 Federal Elections 2016: Election Results for the U.S. President, the U.S. Senate and the U.S. House of Representatives (PDF). Washington, D.C.: Federal Election Commission. ^ a b c d e f Wasserman, Dave; Flinn, Ally. "2018 House Popular Vote Tracker". Cook Political Report. Retrieved January 2, 2019. ^ "What happens now that Democrats will retake the House". NBC News. Retrieved February 27, 2019. ^ Fuller, Matt (January 3, 2019). "Nancy Pelosi Elected Speaker Of The House". Huffington Post. Retrieved February 27, 2019. ^ CNN, Lauren Fox, Deirdre Walsh and Maegan Vazquez. "House Speaker Paul Ryan won't seek re-election: 'I like to think I've done my part'". CNN. Retrieved February 27, 2019. ^ "Kevin McCarthy elected minority leader for next Congress". USA TODAY. Retrieved February 27, 2019. ^ Barabak, Mark Z. "TJ Cox beats Republican Rep. David Valadao to give Democrats gain of 40 House seats, seven in California". latimes.com. ^ Montanaro, Domenico (November 14, 2018). "It Was A Big, Blue Wave: Democrats Pick Up Most House Seats In A Generation". NPR. Retrieved November 18, 2018. ^ Todd, Chuck; Murray, Mark; Dann, Carrie (November 12, 2018). "Democrats had a good showing on Election Day. It's been even better for them since". NBC. Retrieved November 14, 2018. ^ Baynes, Chris (November 13, 2018). "Midterms: Late results reveal Democrats 'blue wave' as party secures best election performance since 1974". Independent. Retrieved November 14, 2018. ^ Greg Price (November 21, 2018). "Republicans suffered worst House midterm defeat in U.S. history based on popular vote". Newsweek. ^ Enten, Harry (December 6, 2018). "Latest House results confirm 2018 wasn't a blue wave. It was a blue tsunami". CNN. ^ "National General Election VEP Turnout Rates, 1789-Present". electproject.org. Retrieved December 11, 2018. ^ "Congressional Profile". Office of the Clerk of the U.S. House of Representatives. Retrieved January 8, 2019. ^ "Lou & Josh ahead by slim margin; San Nicolas beats Bordallo". Pacific Island Times. August 25, 2018. Archived from the original on August 28, 2018. Retrieved August 28, 2018. ^ Garcia, Eric (August 27, 2018). "Guam Delegate Leaving Congress After Primary Loss". Roll Call. Archived from the original on August 27, 2018. Retrieved August 28, 2018. ^ Donovan, Andrew (November 20, 2018). "Counting NY-22: It's mathematically impossible for Rep. Tenney to overcome Brindisi's lead". LocalSYR. Retrieved November 24, 2018. ^ a b c d e f g h i j k l m n o p q r s t u v w x y z aa ab ac ad ae af ag ah ai aj ak al am an Berman, Russell (January 31, 2018). "The 2018 Congressional Retirement Tracker". The Atlantic. Archived from the original on February 3, 2018. Retrieved February 4, 2018. ^ Lundy, John (February 9, 2018). "Rick Nolan announces that he won't seek re-election". Duluth News Tribune. Duluth, MN. Retrieved February 9, 2018. ^ Conradis, Brandon (June 4, 2018). "Retiring Democratic rep to run for lieutenant governor in Minnesota". TheHill. Retrieved June 5, 2018. ^ Giaritelli, Anna (November 7, 2017). "GOP Rep. Frank LoBiondo will not seek re-election". The Washington Examiner. Washington, DC. Retrieved November 7, 2017. ^ Stracqualursi, Veronica (March 25, 2018). "Rep. Ryan Costello will drop bid for reelection in Pennsylvania". CNN. Retrieved March 25, 2018. ^ Becker, Amanda; Cowan, Richard (April 2, 2018). "Connecticut Rep. Elizabeth Esty not seeking re-election". AOL. Reuters. ^ Van Berkel, Jessie (June 5, 2018). "Ellison running for attorney general, opening congressional seat". Star Tribune. Retrieved June 5, 2018. ^ Viebeck, Elise (December 16, 2017). "Rep. Ruben Kihuen won't seek reelection amid sexual harassment allegations". The Washington Post. Washington, D.C. Retrieved December 16, 2017. ^ Leary, Alex; Bousquet, Steve (April 11, 2018). "Rep. Dennis Ross is retiring". Tampa Bay Times. Retrieved April 11, 2018. ^ Leary, Alex (February 19, 2018). "Rep. Tom Rooney will not seek re-election". Tampa Bay Times. Tampa, FL. Retrieved February 19, 2018. ^ Persons, Sally (February 19, 2018). "Rep. Tom Rooney will not seek re-election: Report". The Washington Times. Washington, DC. Retrieved February 19, 2018. ^ Pappas, Alex (February 16, 2018). "Republican Kevin Cramer announces bid to challenge Heitkamp for Senate in North Dakota". Washington, DC: Fox News. Retrieved February 16, 2018. ^ Dumain, Emma (January 31, 2018). "Gowdy, key player in Clinton, Trump campaign probes, won't seek another term". McClatchy DC website. Retrieved January 31, 2018. ^ Ebert, Joel (October 5, 2017). "Exclusive: U.S. Rep. Marsha Blackburn launches U.S. Senate bid". The Tennessean. Retrieved October 5, 2017. ^ "Rep. Garrett is an alcoholic and will not seek re-election". The Washington Post. May 28, 2018. Retrieved May 29, 2018. ^ "Rep. Chris Collins (R-N.Y.) suspending reelection bid after being charged with insider trading". The Washington Post. August 11, 2018. Retrieved August 11, 2018. ^ By Shane Goldmacher and Lisa W. Foderaro. "Reversing Course, Chris Collins Will Seek 4th House Term Despite Indictment". The New York Times. ^ Tamari, Jonathan (January 25, 2018). "Rep. Pat Meehan will not seek reelection after sexual harassment furor". The Philadelphia Inquirer. Philadelphia, PA. Retrieved January 25, 2018. ^ DeBonis, Mike. "Rep. Charlie Dent, outspoken GOP moderate, will not seek reelection". The Washington Post. Retrieved September 7, 2017. ^ Circa, ERIN VOGEL-FOX,. "GOP Congressman Charlie Dent resigning". Retrieved May 22, 2018. ^ "GOP Rep. Charlie Dent Resigning 'In the Coming Weeks'". ^ "Dent Announces Saturday Exit From Congress". Retrieved May 22, 2018. ^ "Pennsylvania Special Election Conor Lamb Defeats Rick Saccone". Vox.com. Retrieved March 16, 2018. ^ "Debbie Lesko keeps Arizona 8th in GOP hands in special election". USA Today. Retrieved April 25, 2018. ^ "Republican wins Texas special election for House seat". The Washington Post. Retrieved June 30, 2018. ^ "Troy Balderson, Ohio Republican, Wins Special Election for House Seat". The New York Times. Retrieved August 24, 2018. ^ a b c d e f g h i j k l m n o p q r s t u v w x y z aa ab ac "2018 Michigan Candidate Listing". Michigan Secretary of State. Retrieved June 1, 2018. ^ Tamari, Jonathan. "Rep. Pat Meehan resigns; will pay back $39,000 used for harassment settlement". Philadelphia Inquirer. Retrieved April 27, 2018. ^ a b "Wolf Sets Special Election for Meehan's Seat on General Election Day". NBC Philadelphia. Retrieved May 2, 2018. ^ a b c d e f g h i j k l m n o p q r s t u v w x y z aa ab ac ad ae af ag ah ai aj ak al am "Unofficial Candidate Listing". Pennsylvania Department of State. Retrieved March 20, 2018. ^ "Charlie Dent: 'It has truly been an honor and privilege to serve the people'". The Morning Call. Retrieved May 14, 2018. ^ "Pennsylvania Elections - Office Results - 2018 Special Election 15th Congressional District". Pennsylvania Elections - Summary Results. ^ "Exit Polls 2018". CNN. Retrieved November 7, 2018. ^ a b c d e f "2018 ALGOP Qualified Candidates > United States House of Representatives". Retrieved January 17, 2018. ^ a b c d e f g "List of Qualified Candidates for 2018". Alabama Democratic Party. January 16, 2018. Retrieved January 17, 2018. ^ a b "2018 Primary Candidate List". Alaska Division of Elections. Retrieved June 4, 2018. ^ a b c d e f g h i j k l m n o p q r "2018 General Election". Arizona Secretary of State. Retrieved September 27, 2018. ^ a b c d e f g h i j k l m n o "Arkansas Candidates Lists". Arkansasonline.com. Retrieved March 5, 2018. ^ a b c d e f g h i j k l m n o p q r s t u v w x y z aa ab ac ad ae af ag ah ai aj ak al am an ao ap aq ar as at au av aw ax ay az ba bb bc bd be bf bg bh bi bj bk bl bm bn bo bp bq br bs bt bu bv bw bx by bz ca cb cc cd ce cf cg ch ci cj ck cl cm cn co cp cq cr cs ct cu cv cw cx cy "Official Certified List of Candidates" (PDF). California Secretary of State. Retrieved September 27, 2018. ^ "Running Green in D13: Tax the rich and stop the wars". June 27, 2018. Retrieved September 12, 2018. ^ a b Padilla, Alex (June 5, 2018). "Statement of Vote" (PDF). State of California. ^ a b c d e f g h i j k l m n "June 26, 2018 Primary Election Results". Colorado Secretary of State. Retrieved June 27, 2018. ^ John B Larson (March 28, 2014). "Home". LarsonForCongress.org. ^ a b c d e Pazniokas, Mark (May 11, 2018). "Manny Santos wins in 5th CD, but Ruby O'Neill to primary". The Connecticut Mirror. Retrieved May 14, 2018. ^ Altimari, Daniela (April 18, 2017). "Elizabeth Esty: 'I Will Not Be Running for Governor'". Hartford Courant. Retrieved April 20, 2017. ^ Turmelle, Luther (May 15, 2018). "DeLauro accepts Democratic nomination in 3rd District convention in New Haven". New Haven Register. Retrieved May 15, 2018. ^ Munson, Emilie (May 14, 2018). "Vowing to fight Trump, Congressman Jim Himes wins Dem nomination again". New Haven Register. Retrieved May 15, 2018. ^ Pazniokas, Mark (May 3, 2018). "Suddenly, Democrats are lining up for Esty's seat". The CT Mirror. Retrieved May 6, 2018. ^ a b "GENERAL ELECTION June 11, 2018 FILED CANDIDATES BY OFFICE". State of Delaware Department of Elections. Retrieved September 27, 2018. ^ a b c d e f g h i j k l m n o p q r s t u v w x y z aa ab ac ad ae af ag ah ai aj ak al am an ao ap aq ar as at au av aw ax ay az ba bb bc "Candidate Listing for 2018 General Election". Florida Department of State. Retrieved April 10, 2018. ^ Anderson, Zac (October 2, 2018). "Democrats select replacement for congressional candidate who died". Sarasota Herald-Tribune. Retrieved October 18, 2018. ^ a b c d e f g h i j k l m n o p q r s t u v w x y z aa ab ac "Georgia Candidates Lists". Georgia Secretary of State. Retrieved April 27, 2018. ^ "David McCaigue Libertarian for Georgia 5th Congressional District" – via Facebook. ^ Williams, Vanessa (March 14, 2018). "Citing Parkland shooting, anti-gun-violence activist is running for Congress in Georgia". The Washington Post. ^ Gwinn, Dominic (May 20, 2018). "Midterm Madness: How Many Millions Will The GOP Spend To Defend Georgia's Sixth?". Wonkette. ^ "COMMITTEE DETAILS FOR COMMITTEE ID C00675629". Federal Elections Commission. March 7, 2018. ^ "Jimmy Cooper for Congress | Bringing Americans Together for the Common Good". jimmycooperforcongress.com. ^ a b "Georgia 2018 General Election". thegreenpapers.com. ^ a b c d e f g "2018 Candidate Filing Report". State of Hawaii Office of Elections. Retrieved June 6, 2018. ^ a b c d e "Idaho Candidates lists". Idaho Secretary of State. Retrieved March 6, 2018. ^ a b c d e f g h i j k l m n o p q r s t u v w x y z aa ab ac ad ae af ag ah ai aj "Illinois Primary Results". The New York Times. Retrieved March 21, 2018. ^ Bustos, Joseph (December 7, 2017). "More candidates file to make runs for metro-east congressional seats". Belleville News-Democrat. Retrieved December 8, 2017. ^ a b c d e f g h i j k l m n o p q r "Candidate List - 2018 Primary Election" (PDF). Indiana Secretary of State. February 12, 2018. Retrieved February 12, 2018. ^ a b c d e f g h i j "Candidate List - June 5, 2018 Primary Election" (PDF). Iowa Secretary of State. Retrieved March 19, 2018. ^ a b c d "United States House of Representatives elections in Iowa, 2018 - Ballotpedia". Retrieved April 28, 2018. ^ a b c d "Forming a Political Party in Iowa". sos.iowa.gov. Retrieved April 28, 2018. ^ a b c d e f g h "Candidates for the 2018 Primary (unofficial)". Kansas Secretary of State. Retrieved June 1, 2018. ^ a b "Candidates for the 2018 General (unofficial)". Kansas Secretary of State. Retrieved June 1, 2018. ^ a b c d e "Election Candidate Filings - US Representative". Kentucky Secretary of State. Retrieved July 3, 2018. ^ a b c d e f g h "2018 Primary Election - Unofficial Results". Kentucky State Board of Elections. Retrieved May 24, 2018. ^ "2018 Election United States House - Kentucky - District 04". Federal Elections Commission. February 6, 2018. ^ "SCALISE, STEVE MR - Candidate overview". FEC.gov. ^ Broach, Drew (May 15, 2018). "Tammy Savoie, retired Air Force colonel, running for Congress against Steve Scalise". The Times-Picayune. Retrieved May 15, 2018. ^ Broach, Drew (March 29, 2018). "Here's what Steve Scalise and his 2018 election opponent have in common: not much". The Times-Picayune. Retrieved March 29, 2018. ^ Broach, Drew (April 18, 2018). "Steve Scalise draws a second election opponent: Howard Kearney". The Times-Picayune. Retrieved May 15, 2018. ^ "RICHMOND, CEDRIC L. - Candidate overview". FEC.gov. Retrieved May 22, 2018. ^ Stickney, Ken (November 6, 2017). "Higgins: 'I bow to no caucus; I've kissed no rings'". The Daily Advertiser. Retrieved November 9, 2017. ^ Barfield Berry, Deborah (March 16, 2018). "So far few women in Louisiana running for Congress". The Advertiser. ^ White, Jr., Lamar (January 17, 2018). "Captain Clay Higgins, Meet First Lieutenant Josh Guillory". The Bayou Brief. Retrieved March 27, 2018. ^ "Rob Anderson For Congress". ^ Fenster, Danny (June 3, 2018). "Local faith-based group moving forward with expansion plans". Daily Iberian. Retrieved June 15, 2018. ^ "Verone Thomas for Congress". ^ "Andrus for U.S. Congress" – via Facebook. ^ "JOHNSON, JAMES MICHAEL - Candidate overview". FEC.gov. ^ "Trundle to announce 4th District run". Minden Press-Herald. June 15, 2018. Retrieved June 27, 2018. ^ "Candidate Inquiry". State of Louisiana Secretary of State. ^ Hilburn, Greg (February 19, 2018). "Abraham sounds like candidate for governor". The News-Star. Retrieved February 20, 2018. ^ a b c "Primary Election List of Candidates and Races". ^ "GRAVES, GARRET - Candidate overview". FEC.gov. ^ "Garret Graves draws opponent for Congress in Baton Rouge-based district". The Times-Picayune. Associated Press. December 12, 2017. Retrieved January 26, 2018. ^ "Andie Saizan for U.S. Congress". ^ a b c d "Maine Primary Candidates Lists". Maine Secretary of State. Retrieved March 9, 2018. ^ Cousins, Christopher (April 10, 2018). "Maine state rep who quit Democratic Party to run for Congress as independent". Bangor Daily News. Retrieved April 15, 2018. ^ a b c d e f g h i j k l m n o p q r s t u v w x y z aa "2018 Primary Election State Candidates List". Retrieved February 19, 2018. ^ a b c d e f g h i "2018 State Primary - Democratic Candidates for Nomination". Secretary of the Commonwealth of Massachusetts. Retrieved June 6, 2018. ^ a b c d e "2018 State Primary - Republican Candidates for Nomination". Secretary of the Commonwealth of Massachusetts. Retrieved June 6, 2018. ^ Davis, Richie (March 29, 2018). "More candidates will challenge Rep. McGovern". The Recorder. Retrieved March 30, 2018. ^ a b c d e f g h i j k l m n o p q r s t u v w x y z aa ab ac ad ae af ag ah "Who's on the general election ballot in Michigan's Congressional districts". MLive.com. Retrieved August 10, 2018. ^ LaCombe, Andrew (August 8, 2018). "UPDATE: Morgan declares successful write-in effort". ^ "Morgan officially secures Democratic nomination for Michigan's 1st District". UPMATTERS. August 9, 2018. Retrieved August 10, 2018. ^ Gibbons, Lauren (March 23, 2018). "Snake Person candidate wants to bring independent perspective to Congress". MLive.com. Retrieved March 23, 2018. ^ a b c d e f g h i j k l m n o p q "Candidate Filings - 2018 State General Election". Minnesota Secretary of State. Retrieved June 8, 2018. ^ Slater, Brady (February 25, 2018). "Sandman's new chance: Party switch fuels optimism for 8th District's third-party candidate". Duluth News Tribune. Retrieved May 22, 2018. ^ a b c d e f g h "2018 Mississippi Candidate Qualifying List" (PDF). Mississippi Secretary of State. Retrieved March 24, 2018. ^ a b c d e f g h i j k l m n o p q r s t u v w x y z aa "UNOFFICIAL Candidate Filing List - 2018 Primary Election". Missouri Secretary of State. Retrieved March 27, 2018. ^ a b c d "Montana Candidates Lists". Montana Secretary of State. Retrieved March 8, 2018. ^ a b c d e f "Official Nebraska Candidate Lists" (PDF). Nebraska Secretary of State. March 1, 2018. Retrieved March 2, 2018. ^ Messerly, Megan; Snyder, Riley (September 27, 2017). "Titus bows out of U.S. Senate race, announces she will run for re-election in 1st Congressional District". The Nevada Independent. Retrieved September 27, 2017. ^ a b c d "Election 2018: Here are the candidates who have filed to run so far". The Nevada Independent. March 5, 2018. Retrieved March 16, 2018. ^ a b c d "2018 Filed Candidates - Non-Judicial". Nevada Secretary of State. Retrieved March 16, 2018. ^ Messerly, Megan; Snyder, Riley (March 16, 2018). "Tarkanian drops out of U.S. Senate race, jumps into 3rd Congressional District at Trump's request". The Nevada Independent. Retrieved March 16, 2018.